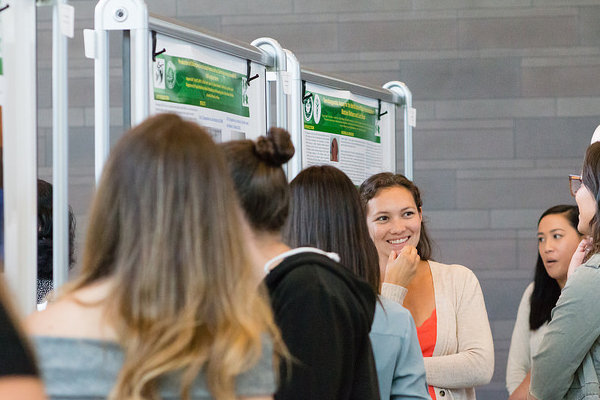 Pictured: All smiles at this research poster stop, during the 2018 Symposium. Deborah Manog Dimaya photo. Undergraduates, Graduates, Medical Students, Residents, Post-Doctoral students, Research Associates and Faculty — all are invited to apply to take part in the Annual Biomedical Sciences and Health Disparities Symposium coming up April 25 and April 26 in the Sullivan Conference Center at the University of Hawai’i (UH) Kakaʻako campus. Sponsored by the UH John A. Burns School of Medicine (JABSOM), the RMATRIX, RCMI, and INBRE III programs and presented by the JABSOM Department of Cell and Molecular Biology, the Symposium attracts some of the top health science research and ideas from throughout academia in Hawaiʻi. IMPORTANT! Abstracts are due by March 15, 2019. The abstract should be a Word Document typed single spaced in Times-Roman 12 point (no less than 10 point) font. All text should be justified LEFT and should fit on one page including title and acknowledgments. 1. 1st Line should start with the title (Use italics if appropriate, followed by (No new line) the institution where the work was done, only if it is different from the department or program mentioned before. 2. The next line should have the presenting author’s name, the author’s current department or program, and their faculty advisor or sponsor in parentheses. 3. The next line should be blank before the first line of the body of the abstract. *Modifications are acceptable if the subject matter cannot be adequately addressed within this framework; however, the author is responsible for ensuring that the organizational format chosen is understandable. 7. Co-authors and acknowledgments should start a new line after the abstract and should be enclosed in parentheses. Remember, submitting your abstract is a commitment to be present with your poster (ONE presenter per poster) at the Symposium during your designated division period. Questions? Contact: Lyn Hamamura in Cell and Molecular Biology.